Discussion in 'The Team Bus' started by Meister, Mar 3, 2017. Good on him, won't be long before someone comes in for him I recon - may be his last chance to get some European football under his belt. Carries on like this and he ll be off to a top 6 club in summer for 40 mill. And he totally deserves it. My bet is Spurs as they have been after game changing attacking players to bolster their squad. However Levy might bulk at Ginos asking price. I can see Doucoure and maybe DelBoy going in summer too, if they have top seasons. Doucoure I can see going, but Deulofeu I see staying for at least another Season minimum. Lets hope so, you re probably right. But if he was to have an amazing season and score 12+ goals then Id be surprised if we didnt get offers for him from big club. I wouldnt begrudge him leaving, the poor bloke has been with Barcelona since he was 10 and now he runs out Vicarage Road. I expect Bobby will be a very happy person right now and in just the right mood for Saturday as River Plate overcame Gremion on away goals. If Doucoure goes perhaps a cheeky bid for 18 year old Exequiel Palacios. A tremendous talent. Box to box midfielder, tackles hard, passes well and looked completely comfortable and not at all out of place last night. Vamos Millionarios. Perhaps the 1881 can organize something similar. He's going to score another beauty tomorrow and create/assist one as well, and we are going to win 2-1. Lump on. Best player to wear the shirt since Barnes? Not sure Barnes was that great for Watford in just his 16 appearances. I always felt Paul Mayo was our best ever left back. He must wonder why we play at our training ground. Only Arakel & Marko$ permitted to use it. The article is badly written - the 27 year old playmaker whose contract has 12 months to run at the end of the season is Hazard, not Bobby P. Whoever wrote the headline obviously fell for the same thing. He was **** on Saturday. Get rid. First leg on Saturday at eight pm. Might be on Freesports. Otherwise the usual channels will suffice. Pretty sure Bobby will be tuned in. Indeed Norn. Personally a bad career move I think although it's likely he will stay at River until next year on loan. He should have moved to a smaller club and guaranteed himself playing time like Redondo . He is definitely a level above Cirigliano and Kranevitter whose careers have imploded. You can watch this Super Clasico on https://www.freeview.co.uk/why-freeview/channels/freesports channel 95 or online. Game suspended and will be played tomorrow due to a waterlogged pitch. Torrential rain in Buenos Aires. Might be the same case tomorrow as the rain is forecast not to stop. I thought it was my usual incompetence when I switched from Milan to the match it showed a Portugese game instead! I've seen that River are none too impressed with Real over the deal, suggesting they've talked to the player and agreed the deal without even so much as officially registering interest with the club. Their chairman seems to believe they are powerless in the situation purely because of his agents actions and Real being the big club they are. An exciting game last night,they don't hang about do they?! To tie up two replies into one. Yes the same situation applies in South America as it does with agents in Europe. They are a law unto themselves and seek most of the time to enrich themselves without a thought to a players career. The player cannot be blamed in one sense given the economic situation in many South American nations when the player is also often seen as the breadwinner for an entire family. Clubs like River who have one of the best academies in the world although in recent years Velez, Racing and Lanus are overtaking them should be very wealthy given the players they export year after year. However the fees are smaller than a European club could command and a significant amount ends up in the pockets of agents and stakeholders. A player like di Maria is bought by Benfica for around 10M Euros then sold on for five times that figure. The European clubs that recruit from Argentina if a player does make it earn a fortune and hence actively recruit the latest promising talents. Every six months the best young players are hoovered up many before they are mentally or physically ready and end up destroying their careers. Hence while the game itself was exciting and River should have wrapped it up before half time there was not much technical play or skill on display. Partly because of nerves, it being a derby but because the best players from both clubs have long gone. Compare to the derbies some thirty to twenty years ago the level of quality has dropped off considerably. Palacios did not really impress either and for once looked a little bit lost on the pitch. 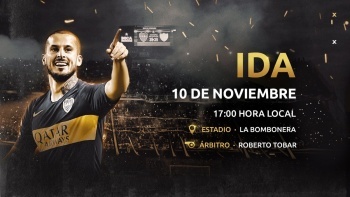 Boca did not even select two of their best youngsters Balerdi and Almendra in their squad and the best players for example Pinola are the old veterans who have returned from many years in Europe earning enough to see themselves in comfort for the rest of their lives. 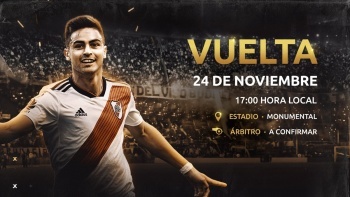 River will have Scocco and Ponzio back for the second leg and having scored two away goals an advantage. Pereyra was not played in the double header against Mexico first game where Lo Celso once again sparkled. You are Tim Vickery and I claim my £5 ! You know your stuff ! Smudger is not a ****. Knight GT and oxhey67 like this. Will play on the left of a five man midfield with de Paul on the other wing and the ability to switch or play off Icardi. A very fluid formation. Kick off is at midnight tonight against Mexico. Named MoTM as well. Looking increasingly difficult to hold onto him as the season goes on. We need to win. Top half might not be good enough. Top 6 and the Europa League might do it. Not putting him in the same bracket but Leicester couldn't even hold onto Kante when they won the league. Whatever we achieve, there is going to be bigger clubs who offer more money. The best we can hope for is to be seen as the best of the rest and hope that interest never comes from bigger clubs. But the fact he's back in the Argentina squad and having a great season, its a catch 22 situation. It still disappoints me that Richarlison wanted to go to Everton. The aim for Watford should be to get ourselves into a situation where such a move isn't seen as a bigger step or better pastures. Yes we have to accept our best players will want to move on but keep replacing them with quality who we then develop quickly to the same level. Soton stopped replacing their sold stars with sufficient quality and that's why they are where they are now. I think Richarlison is a bit of an anomaly. He had a weird hard on for "Ssssssilva" and wanted to play for him, not necessarily Everton. No doubt Everton are a bigger club than us, but all things being equal they’d be a pointless move for any of our players that had over performed. I’d say a natural hard on for Sssssilva. The weird hard on for him is what we have on here.